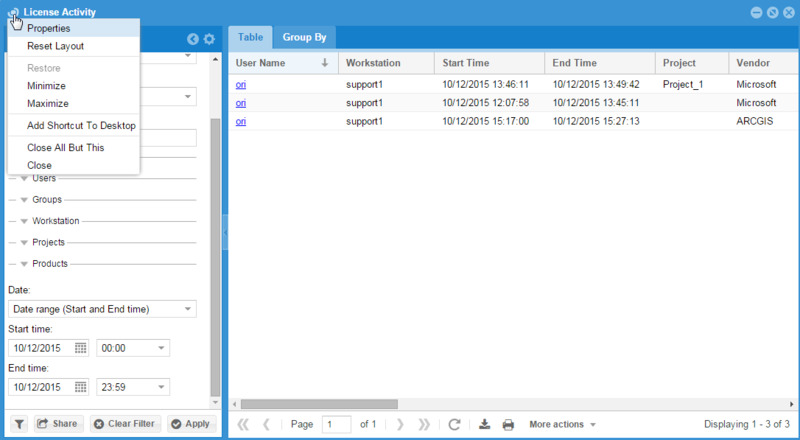 The EasyAdmin web application is the main OpenLM administrative interface for reporting and system configuration. It is accessible from any standard internet browser, e.g. : Mozilla FireFox, Microsoft Internet Explorer, Opera, Apple Safari & Google Chrome. In order to access EasyAdmin from another machine, simply replace ‘localhost’ with the OpenLM Server’s hostname or IP. 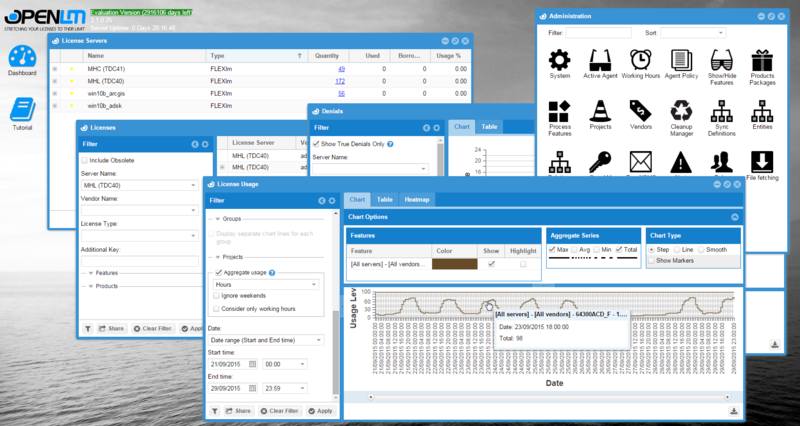 EasyAdmin comes with a lightweight Web server: LightTPD. The default port for connecting to EasyAdmin via LightTPD is 7019. EasyAdmin may also be configured to work with IIS instead of LightTPD. In that case – the default port is 80. Most of these properties are self-explanatory. The ‘Properties’ option enables the user to set a window to open at EasyAdmin launch, and set the window’s refresh rate. Most windows contain a filter pane, normally located on the window’s left side. The filter’s position(Left, Right, Down, Up) may be configured through the gear wheel icon. The filter fields specify the required query that EasyAdmin will propagate to the OpenLM Server. In order to obtain report results, first fill in the filter fields, and then click the ‘Apply’ button. Some filter configurations can be saved and reloaded by using the funnel icon on the bottom-left corner. These filters are saved on the Browser’s cache memory per logged-in EasyAdmin user. Some filter configurations can be shared through the ‘Share’ icon, also located on the bottom-left corner. Some windows have multiple display areas distinguished by respective tabs, e.g. Table & “Group by” displays. The presentation of columns can be controlled by clicking the column headers, and selecting the ‘Columns’ option. The ordering and sorting according to columns can also be configured. Some windows have the option to download their contents as CSV files, a PNG image, or to print them. This functionality supports almost any filter in the system and allows different implementations such as periodic email report or a webpage with constant reports. Set up the scheduled report timing. “Top 10” statistics concerning all monitored applications. The host availability waveform diagram presents license servers’ activity over time. A popular widget with many customers is this Green-To-Red license utilization presentation of specified monitored features. The Currently Consumed licenses (CCL) window lists all active monitored license sessions. It serves as an important interface for license administors. Through this interface, authorized system managers are able to obtain comprehensive real time usage information, as well as manually retrieve a license from any user when necessary. Action buttons: Close application, and Remove license. The powerful license usage report window accounts the actual license usage of single or multiple licensed features with respect to the total number of licenses. It plainly presents license consumption patterns over configurable time periods and sample resolutions. This information can be used to identifying bottlenecks and redundancies in the license inventory. This report is available in 3 different formats, according to the tabs in the display pane: As a table, a chart or as a heatmap diagram. The License Activity window is a very powerful tool that enables system administrators to produce sophisticated reports, and track license activity of individual users. The “Group by” tab on this window facilitates license statistics report generation according to Workstations, Features, Users, Groups, and Projects. This is a presentation of historic license denial occurrences. It is available for FlexLM and IBM-LUM license managers only, and requires the employment of an OpenLM Broker on the license server machine. Please consult this document for more information. Information may be presented as a pie chart, line or table. It may be sliced according to a list of criteria, e.g. : time, user, project etc. OpenLM facilitates monitoring of user activity, and can attribute license usage according to groups and projects. This functionality is often applied in order to implement license charge back policy (license usage billing). OpenLM can attribute license usage to specific active projects. This serves to monitor software asset consumption according to organizational projects, and to produce charge-back reports. There are two interfaces for creating new projects in the OpenLM database. One is this ‘Projects’ window. The other is the end-users’ Agent interface. License utilization: This chart represents a histogram of license usage, i.e. each ‘y’ value answers the question: “what is the percentage of usage time that the respective x licenses have been in use”. This form of presentation ignores momentary usage peaks, and provides a vivid realization of the true license consumption pattern. It clearly depicts the number of licenses that are actually required in the organization. Licenses not in use: Self explanatory. A list of licenses you could probably do without. OpenLM relates to different types of entities, i.e. 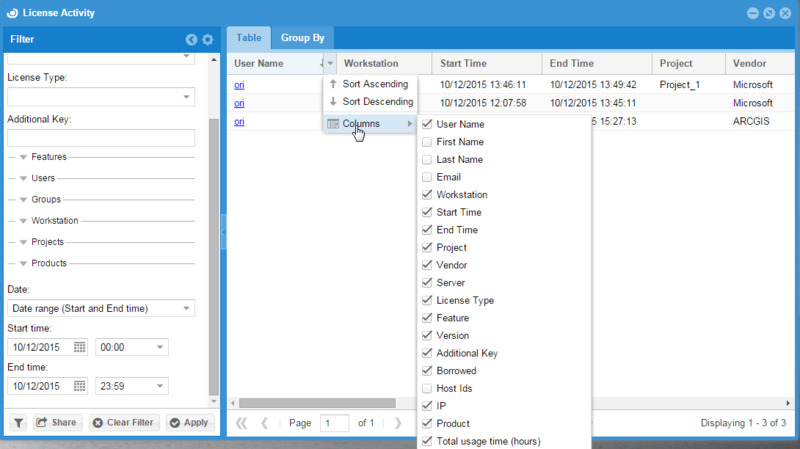 Users, Groups, IPs, Hosts and Host groups. There are various methods for introducing new such entities into the OpenLM database, as discussed above, in the “OpenLM Entities” paragraph. FLEXlm Options files grant license administrators close control over various operating parameters within the constraints of the license model. Licensed features can be dedicated, denied or reserved to users or groups of users, as well as Hosts, IPs, and Host Groups according to the Options file setting. For more information on Options file maintenance, please refer to the dedicated chapter below. 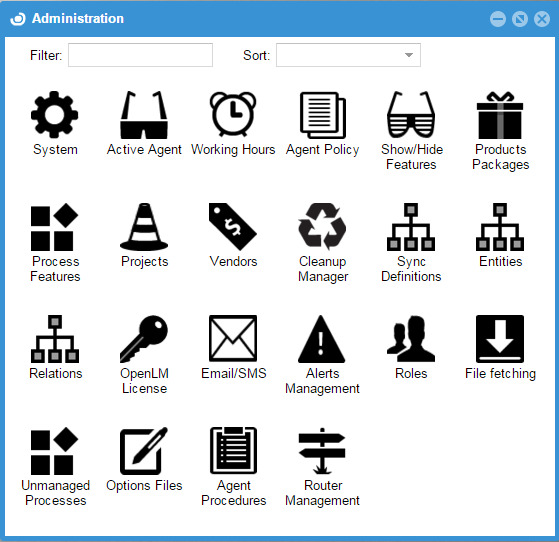 The Administration menu is OpenLM’s interface to a wide variety of administrative activities. Please note that I have elaborated on most of these activities in their respective context. I will therefore not repeat this information here, but rather link to the proper paragraphs. Setting the organization’s work hours. OpenLM will accumulate usage information regardless of the this configuration, but historical license usage may be configured to disregard weekends and after-hours. These are different windows that relate to the OpenLM Agent. The Agent is located on end-users’ workstations, and provide different capabilities deriving from monitoring processes on workstations. These capabilities include idle license retrieval and ‘Unmanaged licenses’ monitoring. Show/Hide – Users may select features to be omitted from report windows. License usage information will be accumulated regardless of the this configuration. Products & Packages – Manual method for arranging licensed features in Packages. Other methods (via reading the FlexLM license file or updated online) are presented here. These windows are all a part of the Active Directory synchronization process. An elaborated description is provided in the respective paragraph. Sets up some properties of the Options file maintenance capabilities, including data flow direction. File fetching is done through the “License servers” window. These are some related configurations, e.g. : Enable fetching, Timeout and location for the target directory. OpenLM provides a backbone for managing and reporting usage of licensed applications according to work projects. Setting up OpenLM Routers, Router groups, and routing rules. The contents and capabilities available by your OpenLM license is presented in this window. A tool for cleaning up unneeded information. Use this tool carefully, and only after backing up your database, as the cleanup process is irreversible. Please read more about it here. Set up the OpenLM license count to match the vendor license consumption policy. The default EasyAdmin URL is http://localhost:7019/EasyAdmin2/index.html. In order to connect to EasyAdmin from a different machine on the network, simply replace ‘localhost’ with the target OpenLM Server hostname. EasyAdmin addresses APIs to the OpenLM Server via proxy, on two separate ports: 7014 (XML) and 7020 (SOAP). All relevant ports (7019, 7014, 7020) are unblocked by Firewall.